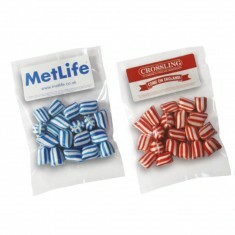 Neatly packed bags of your choice of sugary treats, our Promotional Sweet Bags section is the place to go if you’re looking for some sweet giveaways for your next event. 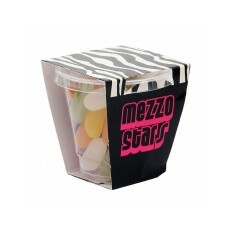 Push the boat out the whole way with your sweets and even custom print to actual sweets with a logo with our customised Organza Bag with Icon Sweets. These tablet shaped custom printed sweets are a throwback to the day of refreshers and you can print directly to the sweet with food safe inks! 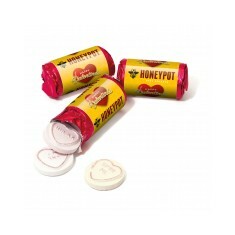 On the subject of retro style sweets, our personalised Love Hearts Roll is packed with the retro sweets, wrapped in foiled paper and then wrapped again in paper that is customised in full colour with your design. 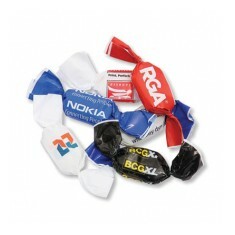 Branded sweet bags can be a great way to get your name spread throughout the event or exhibition or a nice, thoughtful thank you for your customers. A goodwill pick-me-up that are great value to hand out to your customers and are a nice reminder that you are grateful for them spending time with your company. 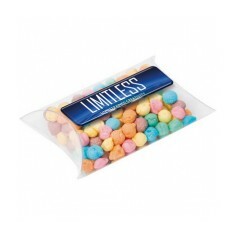 Whether it is candy shop style bags, sealed plastic wraps or Tic Tac style boxes, we have a wide range of products for you to pick from when it comes to getting your custom printed sweet bags. 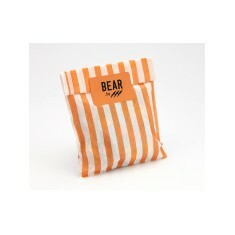 Select your favourite and add it to your basket to get a price for your personalised sweet bags today! Contains 8 fizzy sweets. 6 flavour choices. 4 food safe ink choices. 12 month shelf. Non-GMO salted or caramel toffee popcorn. 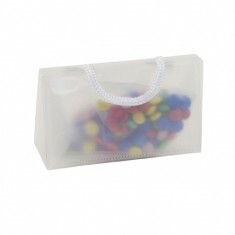 White or clear cello bag. 6g. 4 Cherry flavoured sherbet hearts in a flowrapped bag. 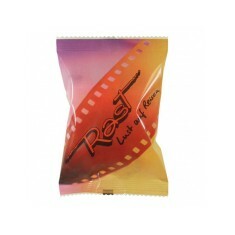 Also available with 4 s..
Take the flavour of the cinema to your event with our 6g of Toffee Popcorn bag..
10g of roasted and salted peanuts in a white or clear flowrapped bag. 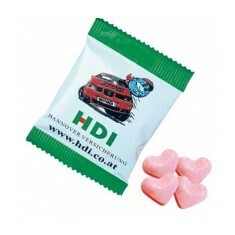 The perfect giveaway product, our Digitally Printed Sweets are branded with ..
Retro style. Mix of yellow & pink sweets. 12 month shelf life. UK made. 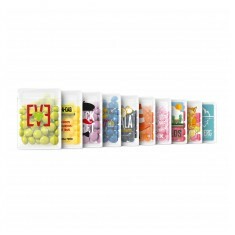 8 flavours available. 100% natural fruit flavouring. Tic-Tac style box. Branded to front. 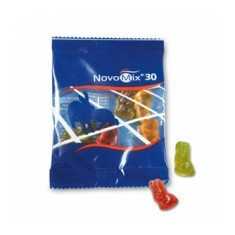 Clear small pouch, branded with your artwork in full colour on a domed strip o.. 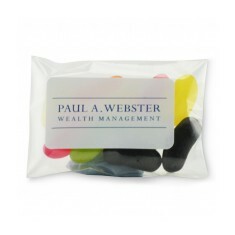 Enjoy a sweet treat with our custom printed Mini Sweets Pockets! Containing 20.. 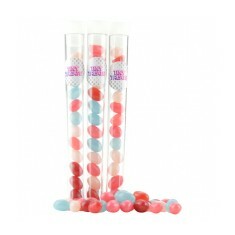 Supplied in a clear pocket sized bag, we can custom print our Bag O'Humbugs wi..
Sturdy plastic tube. Various fillings available. UK made. Fast turnaround. Enjoy life's little luxuries with our custom printed Beans for One. 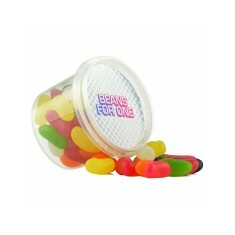 A full 90g..
Give your clients a tasty treat with our promotional bag of jelly beans. Conta.. 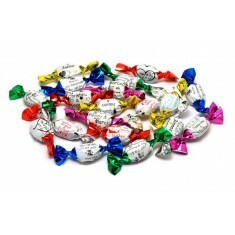 Huge range of fillings available. Approx. 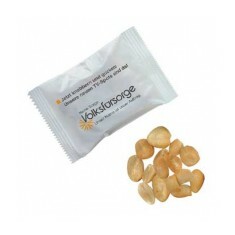 50g per bag. Produced in UK. 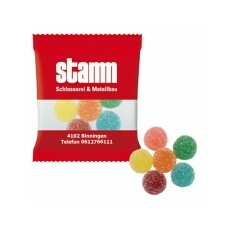 Natural fruit flavours & colourings. 6 lid colour choices. Vegan, kosher & halal diet suitable. 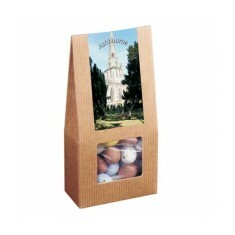 A stylish kraft card bag filled with your choice of either 75g of wrapped tea ..
Small Tub containing a Jelly Beans, cola bottles or Dolly mixtures and persona.. 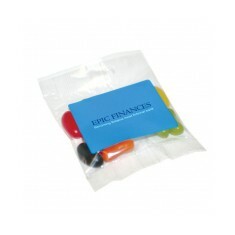 Sweeten up your customers with our bespoke printed Candy Bag. The bags are ava.. Individually flow wrapped. Mix of flavours. Great for hotels. 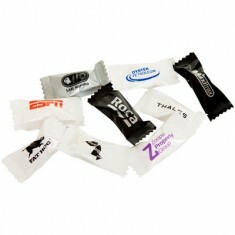 Sweeten up your next promotion with our custom printed Flowpack Sweets! These..